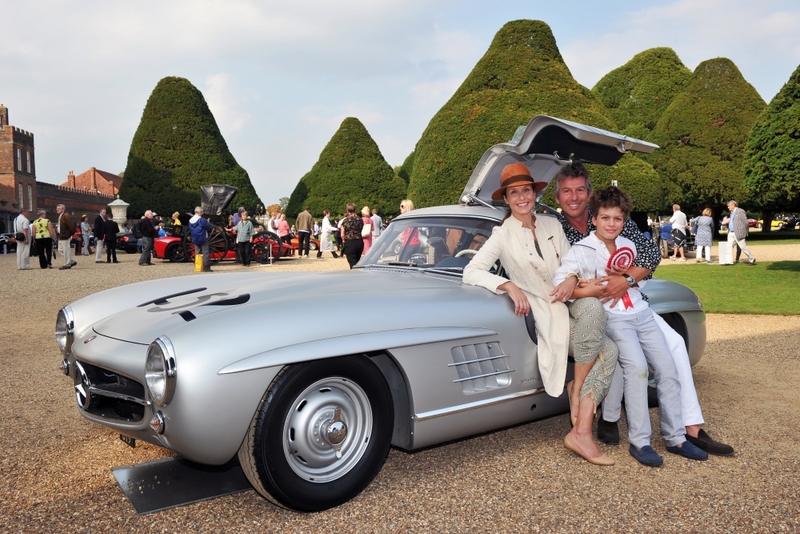 For the very first time, visitors to the recent Concours of Elegance – held to great acclaim at Hampton Court Palace from 5-7 September – were able to vote for their personal favourite of the sixty handpicked concours cars. The overall winner of the inaugural Public Choice vote was a rare alloy-bodied 1955 Mercedes-Benz 300 SL Gullwing Coupe, one of just 29 alloy Gullwings built, from a total of 1,400 300 SLs – the others being steel-bodied. The Public Choice-winning Mercedes-Benz was the 19th alloy 300 SL built, first ordered by Italian gentlemen racer Dottore Alberico Cacciari, who raced it at every opportunity. This car was the only alloy-bodied 300 SL to compete in the 1956 and 1957 Mille Miglias, with Cacciari driving. The car appeared at the Concours of Elegance as it raced in 1956, with its ‘452’ racing numbers, and original tool kit and factory-fitted luggage. Voting for the 2014 Concours of Elegance Public Choice was conducted by simply texting the entry number of the visitor’s favoured concours car from their mobile telephone, all helping to raise money for the Concours official chosen charities in the process. The overall 2014 Concours of Elegance ‘Best of Show’ – as chosen by the 60 concours car entrants, was the stunning Touring-bodied 1931 Alfa Romeo 6C 1750 ‘Flying Star’, a spectacular show car, which made its concours debut in 1931 at the Concorso d’Eleganza Villa d’Este, where, accompanied by the model Josette Pozzo, it won the Coppa d’Oro di Villa d’Este trophy. The Concours of Elegance at Hampton Court was the first time the Alfa Romeo had appeared in the UK. The dates and Royal Palace location for the 2015 Concours of Elegance will be announced shortly.